Since 1950, Ferrari Tailor-Made is the exclusive personalization program from Maranello developed for clients seeking to create a truly bespoke vehicle. Through this program, every new Ferrari can be ordered to the exact whims and desires of its owner, resulting in vehicles that are the embodiment of each owner’s unique style. The Ferrari brand creates an emotion of luxury, elegance, sportiness and exclusivity. The various elements of Ferrari are reflected in these Tailor-Made collections. Each collection pulls inspiration from a different part of Ferrari’s iconic history, giving new Ferrari owners countless options for creating the Ferrari of their dreams. 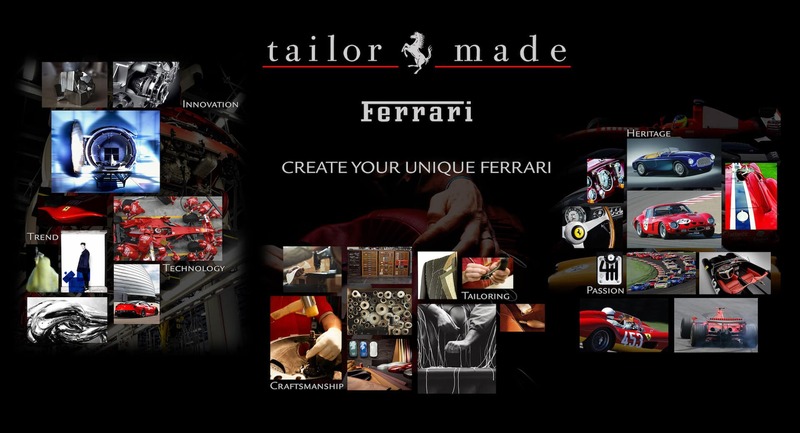 “Creativity, research, original materials, superb craftsmanship and attention to detail are the cornerstones of the Tailor-Made program, which offers three collections inspired directly by Ferrari’s DNA: Scuderia, Classica and Inedita,” states Ferrari. The Scuderia inspiration is derived from Ferrari’s sporting history, offering racing: materials, finishes and liveries. The Classica collection provides a modern twist on the styling cues and features of Maranello’s iconic GTs. Inedita introduces an element of experimentation and innovation in terms of styling, colours and materials. While customizing a vehicle through the Tailor-Made program, clients are supported by a Personal Designer who ensures that the results will both please the owner and be consistent with the quality and style one expects from the Ferrari brand.